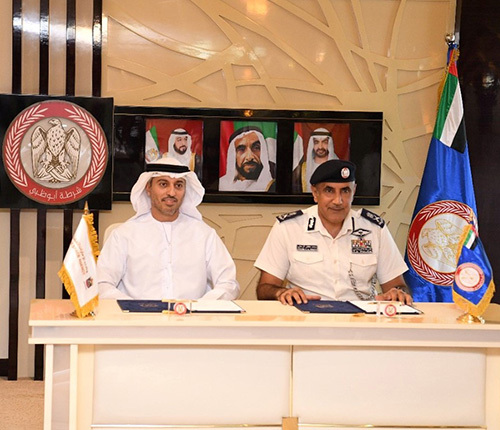 The UAE Space Agency and the General Command of the Abu Dhabi Police, ADP, have signed a Memorandum of Understanding, MoU, to promote their cooperation, strengthen their strategic partnership and exchange technical expertise, to serve their mutual interests, Emirates News Agency WAM reported. The MoU was signed during an official ceremony at the headquarters of the ADP General Command, with the attendance of Dr. Ahmad bin Abdullah Humaid Belhoul Al Falasi, Cabinet Member and Minister of State for Higher Education and Advanced Skills and Chairman of the UAE Space Agency, Major General Mohammed Khalfan Al Rumaithi, Commander-in-Chief of the ADP, and Dr. Eng. Mohammed Nasser Al Ahbabi, Director-General of the UAE Space Agency, as well as officials from both sides. According to the MoU, both sides will aim to improve their cooperation in professional and training areas, provide consultations and technical support in areas related to space science, train their personal advanced skills related to space technologies, exchange expertise, support innovation and foresee the future. Dr. Al Falasi said that the MoU is part of the agency’s efforts to improve its relations with all government authorities, with the aim of strengthening strategic partnerships and exchanging technical expertise, in line with relevant government plans and policies. “The space sector has witnessed considerable developments in recent years in terms of human resources and technical capacities, in light of the ongoing support of the country’s wise leadership. The MoU will enable us to benefit from these capacities, to ensure sustainable leadership and success, which will strengthen the UAE’s position among the best countries in the world,” he added. Major General Al Rumaithi praised the cooperation and partnership between the ADP and the agency, which will promote the exchange of expertise, while noting its importance in achieving the aspirations of the government and the country’s plans to develop an artificial intelligence, AI, strategy. Foreseeing the future is a key part of the ADP’s efforts to keep pace with global developments, take advantage of future opportunities and challenges, and develop proactive scenarios and solutions using scientific research tools, Al Rumaithi said in conclusion.